Hide Window Hotkey is a utility which allows you to hide the windows, and programs which are running on your screen.It will instantly hide or close all (or some) programs on your screen through Mouse Hotkey or Keyboard Hotkey in order to prevent uninvited persons from seeing them.It will serve you well at your work place or at home. By hiding windows you have the freedom to protect your privacy and hide sensitive information from praying eyes.For example,you hide some selected programs by pressing hotkey.At a later time you will be able to return all hidden windows back to the desktop and continue your work.And you also can close those hidden windows through another hotkey.You also can hide the current window through a hotky. Automatically manages any window you specify. For instance, some web browsers open up in a non-maximized window. Using Hide Window Key,you can set those windows to automatically maximize (minimize, normal, minimize to tray,stay on top) every time they're opened. It works with almost any program, including web browsers, Notepad, etc. Hide Window Hotkey stays running in the system tray, so it stays out of your way while it works. It can also protect the hidden windows with a password. You can set other options too, such as muting all sounds during hiding, specifying hotkeys etc.It also can set application windows transparency.Reorder and arrange the windows on taskbar based on your choice.Show window property of application,such as window handle,class name,process id etc.It also could hide taskbar and hide desktop icons. 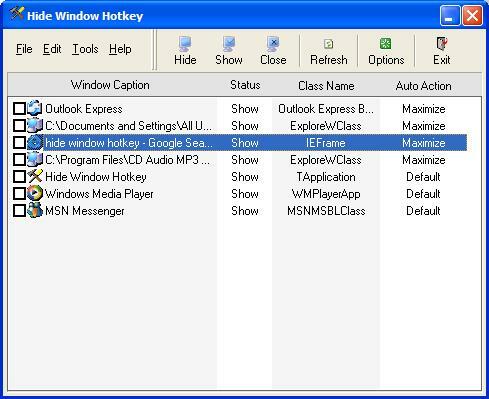 Hide Window Hotkey Hide applications quickly by Hotkey.Auto resize programs,transparency windows.